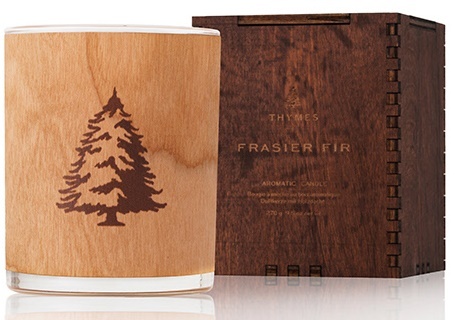 Frasier Fir from Thymes was a pretty amazing candle and I mean that in every way imaginable. Presentation was beyond incredible and the fragrance… wow!! So authentic! I don’t pamper myself very often with luxury brands so when I do get to burn one, I savor every moment… they’re just so decedent and even look and feel different to me. Maybe it’s because they’re generally so expensive? You also know a luxury candle when you see one… the packaging, the glass vessel, the unique fragrances… every fine detail is perfected and presented to you with pure class and elegance. Now a little bit about the candle itself… I’m in love!! The vessel was glass but wrapped in a wooden veneer with a Christmas tree embossed right into the wood with a perfectly centered wood wick. Yes!! I was so excited to burn this candle and all because of the wood wick. It seemed unique for a big brand luxury candle. Now onto the box this candle came in. Yes, I’m actually going to gush over this box because I can’t help myself. Look at the picture above. Do you see the box? It looks like wood doesn’t it? That’s because it is. I was floored by the quality and how rustic both candle and box were – so yeah, presentation completely blew me away and exceeded all my expectations. Seriously… what a terrific gift this candle would make, especially to a special fella in your life. What did my Frasier Fir candle smell like? Reminiscent of Siberian Fir needles, heartening cedarwood and relaxing sandalwood, this candle features a wooden wick that crackles as it burns, creating a fireplace-like ambiance. Wrapped in natural cherry wood veneer and beautifully decorated with the Frasier Fir tree, this candle comes packaged in a wooden box. Interesting… I would have never guessed sandalwood was in this fragrance. That’s what I love about having scent descriptions to reference when reviewing. It’s fun to compare what the scent description says vs. what my nose picks up on. On cold sniff, my nose picked up on Siberian Fir the most. I didn’t smell cedarwood or sandalwood. I asked my hubby if he smelled either of those and he agreed, he said it smelled like Douglas Fir. I decided to light this candle in my bedroom which is a pretty big room and boy did it perform like crazy! Within 20 minutes, the fragrance of Frasier Fir was everywhere and traveling beyond the room as well. The aroma wasn’t *in your face* strong but a perfect medium and that’s in a large room (which I was really happy with.) In a medium or smaller room, the aroma would knock your socks off for sure so that’s something to keep in mind should you purchase this candle. The fragrance… pure Christmas tree and I will stress, it was perfect! Nothing fake or synthetic either – it was totally realistic. My husband LOVED it!!!! He commented on it every day it burned and asked me to get another one when this candle finally finished. (SHOCK!!) When he actually *asks* me to spend money on a candle as expensive as this one, you better believe it’s a keeper. Did I ever smell sandalwood or cedar wood? I don’t think so but it could be my nose just didn’t pick up on those notes. To me, this fragrance was solid Frasier Fir. It was beautiful and so perfect for the holidays – and yes, I‘ll be purchasing another one in the near future for sure. My candle burned perfect. No issues at all with the wood wick. I did have to trim it down before each lighting to keep the fame at a steady level but that’s normal with any wood wick. I think it’s safe to say I loved everything about Frasier Fir from Thymes. Everything. Presentation was perfect, the scent was amazing and it was also beautiful to watch burning. Also want to note, I did hear and love the sounds that came from the wooden wick the entire time. To me, it sounded like a crackling blow torch and a sound you hear loud and clear the moment you walk into the room. If you’ve been curious about this brand, I’d say give them a try. 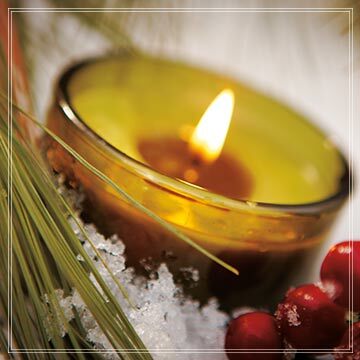 My favorite site to shop on is Candles Off Main… a one stop shop for all luxury candle brands. What are the sizes and costs?